The meeting will focus on how to implement privacy and data ethics in international organizations, and on how to access public-private sector data for use in humanitarian and development contexts. Access to Data for Public Good: Mechanisms and Schemes for Sharing Data for Humanitarian and Development Causes. 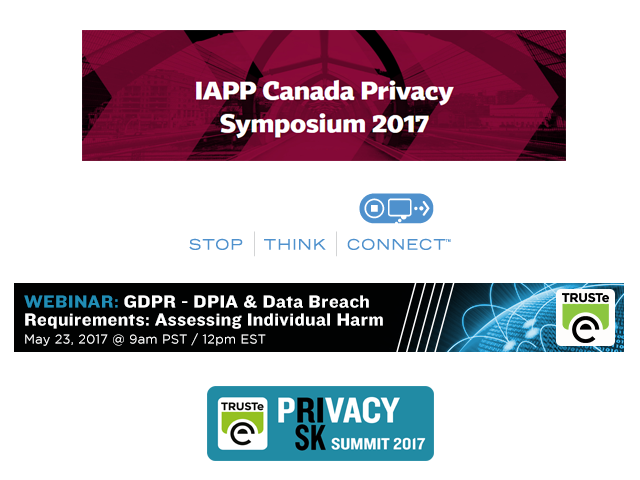 TRUSTe’s Hilary Wandall will be presenting on “Privacy on the Ground: Managing Personal Data and Privacy Risks in Organizations”. With so many critical privacy issues facing you this year and so much uncertainty on the international horizon, Symposium could not be happening at a better time. Stop by TRUSTe booth #9 to say hi and learn about TRUSTe’s GDPR Implementation Solution. With warm weather and a holiday weekend right around the corner, you may be thinking about a summer getaway. Whether you’re planning a family trip, attending an out-of-town wedding or taking an exotic getaway, you’re likely to use your connected devices for pre-travel planning, while you’re on the road and when you return. It’s important to keep cybersecurity and privacy in mind while navigating your summer travel plans. Join @STOPTHNKCONNECT for a Twitter chat that will discuss steps you can take to protect yourself, your devices and your information and enjoy a safe, stress-free summer escape. DON’T FORGET: Register for the upcoming Privacy Risk Summit! Seats are limited. Visit the event page for more information.